If one physicist's theory is correct, we could be closer to sitting in a captain's chair, queuing up a warp, and saying "engage" than we think. 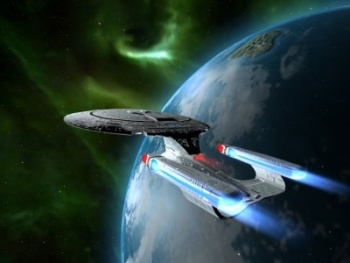 Captain Picard always made sending the Enterprise into light speed look so cool. With the flick of a few fingers, Picard's ship would engage its warp drives and his crew would be off into the depths of space. Perhaps someday, you can be just like Picard, if physicist Franklin Felber's "hypervelocity propulsion drive" theory is correct. This theory states that "a relativistic particle should repel a stationary mass ... [and] that this effect could be exploited to propel an initially stationary mass to a good fraction of the speed of light." I'll guess this means we can travel through space really fast if it's true. Technology Review reports that Felber's theory could reasonably be tested at the Large Hadron Collider, the highest-energy particle accelerator in the world, should it ever be activated. The LHC was supposed to be put into operation in September of last year, but nine days after its initial activation suffered a fault that damaged many of its superconducting magnets. Believe me, if you're operating a particle accelerator, you don't want the magnets to be all messed up. There is a lot of complicated stuff that goes along with this theory. According to Felber, it should work because "the repulsive effect allows a relativistic particle to deliver a specific impulse that is greater than its specific momentum, thereby achieving speeds greater than the driving particle's speed." Stress on a spacecraft and its occupants should not be an issue due to the face that "the spacecraft follows a geodetic trajectory, in which the only stresses arise from tidal forces." That last sentence I don't get, but maybe someone else does. The Large Hadron Collider is a perfect testing ground here, because the particles accelerated could conceivably contain enough energy to demonstrate Felber's repulsive force. These particles won't be launching little blocks of metal into the sun, though, the test would be done on a much smaller scale. The results from testing at the Large Hadron Collider could put an end to Felber's theory, or save it. Meanwhile, I'll be shaving my head, ordering "tea, Earl Grey, hot," and flipping my fingers to practice for my inevitable future as a starship captain.